Barcode image creator software builds cost effective attractive barcode stickers with support to many barcode standard fonts like Code 93, Code 39, Code 11, planet, EAN 8, EAN 13 etc. Business barcode maker provide facility to store designer barcode labels into popular picture format such as gif, tiff, bmp, jpeg and more. Affordable barcode label maker is capable to print multiple dissimilar barcode images on single paper with support to any ordinary printer. Simple and reliable barcode tag designing application is comprehensive solution for producing number of printable and attractive barcodes in efficient manner. Business barcode maker software allows copy and paste created barcode sticker into any popular Windows applications including MS-word, Ms-excel, paint etc. Professional barcode image producing program generates 2d and linear barcode asset tags in just few mouse clicks. 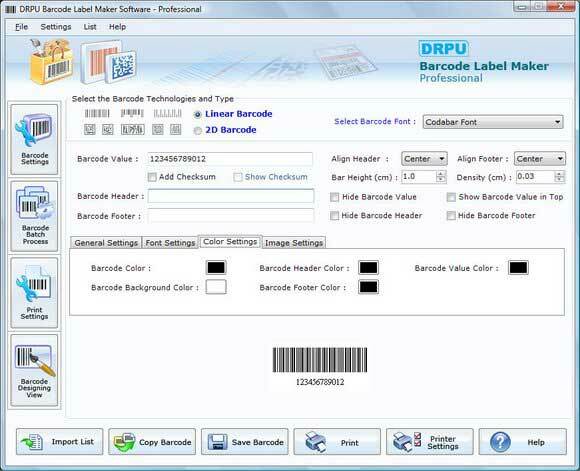 Advance barcode label builder utility is successfully used in many national or international organizations some are shipping, manufacturing, telecommunication, inventory services, library, education, blood bank etc. Barcode sticker designer software is comfortable with all latest version of Windows operating system like Win XP, Vista, 7. Barcode label generator utility is available with interactive graphical user interface, so it can be easily used by technical as well as non technical users. Feature: * Barcode image designer program generates random, linear or constant value barcode series as per user requirement. * Business barcode maker utility does not require any expert guideline or support for creating own style customized barcode tags. * Affordable barcode sticker creator software creates unique and proficient barcode images of various size, color, style, font etc. * Professional Barcode image builder application support many designing objects (line, circle, rectangle etc) for making high quality barcode stickers in efficient manner.